Wheeling in from the North Atlantic, just in time for their annual festival, the Coquet Island puffins are getting ready to lay their eggs, feed their pufflings and greet passing visitors. In Amble, the preparations for the puffin festival are being finalised and the list of fun and activities is going up. On Saturday 26 May, fun includes beach art, stalls, children’s amusements, maypole dancing, ‘Pete the Puffin’s Big Day Oot’, puffintastic crafts, come-and-try kayaking, children’s storytelling, live music from latin/Samba band SALIDA. On Saturday morning, Atholl Swanston will lead a guided nature walk, and Harry McQuillen will lead a guided history walk each afternoon at 2pm. In the afternoon there will be a talk from Bartle Rippon about the Amble Railway, and music in the evening (at the NTC Dovecote Centre) is from local singer/songwriter duo CLOUDBERRIES. On Sunday 27 May there will be stalls, children’s amusements, and guided walks, (including one at Hauxley by Tim Mason – as seen on BBC Countryfile – but you need to book: Ring 0777 151 5469). There’s have-a-go at walking football, beach art, a pop-up poet, live music from indie/rock band YELLOWSTONE and local singer/songwriter BRIAN ENGLISH, puffintastic crafts, storytelling, and watersports in the form of stand up paddleboarding, and a guided estuary kayak tour. At lunchtime, there’s a talk by wildlife photographer Martin Kitching on marine wildlife photography, followed by an afternoon talk on local history from Bartle Rippon, and an evening talk by Jim Morrison on the growing problem of plastic in the oceans. On Bank Holiday Monday 28 May we have another busy day of fun: beach art, children’s amusements, a guided nature walk from Atholl, and Harry’s guided history walk. Ian Williams our pop-up poet will also be performing again. There will be more live music in the Square, from Brian English and from 60s/country/rock band The Band 2. There’s dancing too, with the inaugural performance by the newly formed Amble sword dancers (mind your heads) and a return from the ever popular Tribe Zuza tribal dancers. The fun continues with puffintastic crafts, watersports, children’s storytelling, a delightful and very popular dog show (on the Braid near the beacon), kick start sports for children (also on the Braid), and pottery painting (at 42 Queen St). 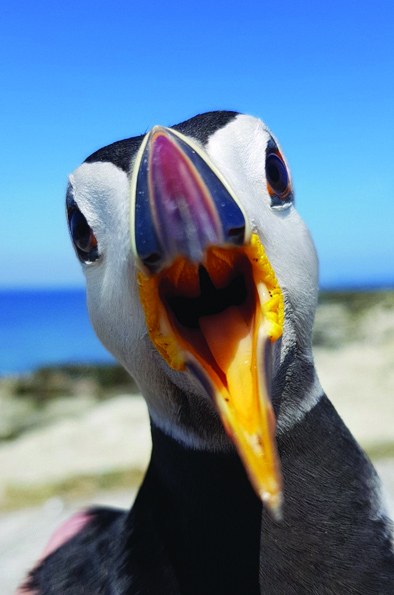 We’re excited to confirm that in the afternoon there will be a talk and virtual reality experience of the Coquet Island Puffins from RSPB’s Paul Morrison (also seen on BBC Countryfile!). The evening event is a talk on the history of Amble RNLI by John Young and Rodney Burge. To see the Coquet Island puffins and thousands of other seabirds (including the very rare Roseate Tern), book yourself on a Puffin Cruise, from Amble Harbour. The trip takes about an hour (there is no landing on Coquet Island). Trips are weather and tide dependent. Booking is essential. Ring Puffin Cruises on 01665 711975 or 0775 2861 914.